Keson PT545 String Line Twisted Nylon Pink 545 ft.
Keson String Line Twisted Nylon White 545 ft.
• ...and many other uses! The Keson RRT12M Measuring Wheel provides dependable calculations for up to 10,000 meters. It yields accurate measurements in meters using its durable 12.5 inch diameter wheel. There are several convenient features embedded in the handle, such as a brake, reset button, and a locking mechanism. It displays numbers on a magnified 5 digit counter that has an additional reset button. This useful tool is perfect for law enforcement personnel, landscapers, telecom/cable maintenance, sidewalk installations, and other situations that require reliable measurement of distances. The Keson RRT12 & RRT12M Measuring Wheel is engineered to provide accurate calculations. Its steady wheel remains in contact with the surface of the ground even on dirt, gravel, or dirt. This device also has gear and shift transmission for added accuracy. Additionally, the placement of the counter directly above the wheel creates a center of gravity that enhances balance and, as a result, precise measurements. The Keson RRT12 & RRT12M Measuring Wheel is perfect for several outdoor tasks. Use it to determine distances for planned sidewalks, driveways, or other surfaces needing pavement. Law enforcement can use it to assess distances at accident or crime scenes. It is also a useful device for when measuring distances for cable installation or maintenance. 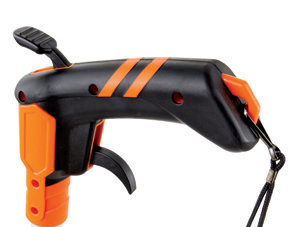 This tool can also be used for landscapes, hardscapes, pools, and other outside construction. 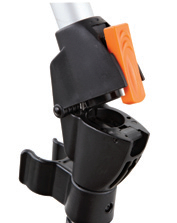 The handle of the Keson RRT12 & RRT12M Measuring Wheel is equipped with a number of convenient features. It bends on a 90 degree angle that makes it fit naturally in your hand and adds maneuverability to the entire device. Use it to steer the wheel straight ahead, stop suddenly, and turn in either direction. The brake trigger reduces the chance of error because it stops both the wheel and the counter instantly whenever you press it. There is also a reset button on the handle for setting the counter back to zero. This convenient button eliminates the need to bend over or to use your foot to reset the other reset button that is located on the counter. The Keson RRT12 & RRT12M Measuring Wheel also includes a second reset button located on the counter. This device also conveniently collapses to 20 inches for easy storage and has a lock that keeps it securely closed during transport. There is also a convenient kickstand and a 2 year limited warranty.